Gull Lake Ministries has served as the catalyst for life transformation within the family for nearly a century. 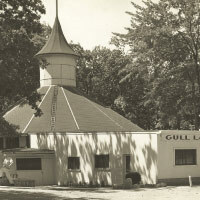 Established in 1920, Gull Lake Ministries possesses a history rich in ministry and relational renewal. Powerful speakers and missionaries have graced our Tabernacle stage for decades, and the Gull Lake Ministries staff inspired faith in the hearts of young and old alike. Today, our purpose remains the same as that of our founding fathers. We seek “to impact lives for God’s glory” while continuing to develop meaningful ways to strengthen the family and equip the saints for God’s service. Explore highlights from Gull Lake Ministries’ history below! More history on Gull Lake Ministries is available in the book Great and Mighty Things, by Dr. Wendell K. Babcock, which may be purchased in the GLM Dock Shop.